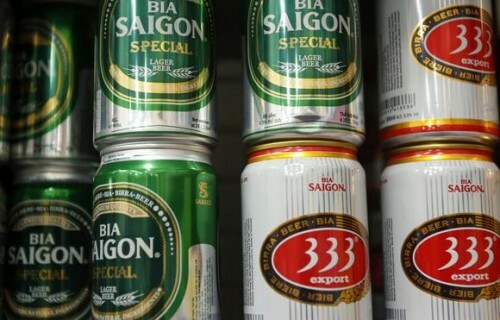 Japan's Asahi Group Holdings and Kirin Holdings are considering bidding for shares of Vietnamese state-owned brewer Saigon Beer Alcohol Beverage, in an auction that could come as soon as next month. The Vietnamese government holds an 89.6% interest in Sabeco, as well as 82% of Hanoi Beer Alcohol Beverage, or Habeco. Together, the two breweries control roughly 60% of the country's beer market. As a part of its state-enterprise reform efforts, the government aims to unload its entire holdings in the two by the end of 2017. A 53.6% interest in Sabeco, to be divested by the end of the year, will be sold off first. Vietnam, a nation of 90 million people with growing beer consumption, is one of the few promising beer markets in the world today. For this reason, many major foreign breweries are showing interest in the planned sale of the Sabeco stake, which is predicted to raise around 200 billion yen ($1.93 billion). Facing a shrinking domestic market, Asahi and Kirin have stepped up expansion of overseas operations. Kirin's foreign business strategy focuses on Asia. In line with this, the company acquired Myanmar Brewery, the Southeast Asian country's No. 1 beer maker, last year. Asahi is seeking a broader market presence. It is considering purchasing a beer business covering five East European countries from the U.K.'s SABMiller, which itself was bought by world leader Anheuser-Busch InBev this month. The price tag for the East European operations, currently estimated at about 500 billion yen, could go higher if a bidding war erupts.